Tony Davies has the sort of clear-skinned complexion and naturally ruddy cheeks that can only be attained by years outdoors. He is the fifth generation to work the farm - in the Elan Valley, Powys - on which he now lives with his wife Angela and four children. 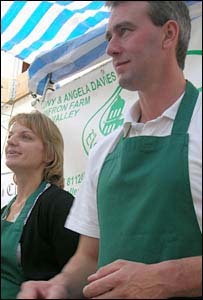 But when I meet him, he and Angela are running a stall at Abergavenny's food festival. Their mission: to sell 10 sheep's worth of organic mutton. For many people, the only time mutton comes anywhere near their lips is in the form of a criticism - "mutton dressed as lamb". "Many people think mutton is just old lamb but it is not," says Mr Davies. "It has its own qualities." Victorian cook Mrs Beeton extolled mutton for its "fine flavour and digestible qualifications". But readily available lamb have led to the demise of mutton, making it hard to find commercially. Mr Davies has always served mutton "mainly to friends and family" but about a year ago, he decided to focus on producing mutton exclusively. "Every government business advisor told me [focusing on] mutton would not work," he said. But as he serves a customer, Mr Davies says proudly: "We've proved them all wrong." None of his 2,000 sheep are destined to be sold as lamb, he explains, pointing to a photo of himself herding on horseback. The risk seems to be paying off. By lunchtime - several hours before the festival's end - the last remaining cuts are selling out. Mrs Davies is looking in turns concerned and delighted by the success at their first Abergavenny festival. The sell-out has been helped by an earlier demonstration by Mark Hix, chef director with London's Ivy and Caprice, and locally-based chef Mark Tebbutt, of the Foxhunter in Nantyderry. Following a campaign for a mutton renaissance spearheaded by Prince Charles in late 1994, they are the among several top chefs to have reintroduced mutton on their menus. A packed and attentive audience watched a step-by-step guide on how to make mutton and crayfish stargazy pie. The speed with which the audience subsequently wolfed down the pie was impressive. 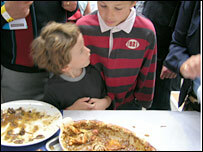 Brothers Jules and Louis Young were small enough to get to the front and tuck in, as adults battled for a taste. Soon after, a steady flow of people headed up the hill to see the Davies' stall. "Wales has definitely become more foodie," says Herefordshire-based Denis Gwatkins, who is selling home-brewed ciders and perry. This view, echoed by others, is evident in the huge number of food festivals and farmers' markets. 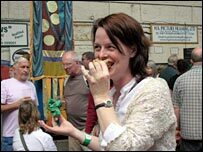 Many say Abergavenny has caught up with Ludlow - long seen as one of the best festivals around. But while the interest in food throughout the UK has grown, the time spent cooking has fallen. Mr Tebbutt says people have got out of the habit of slow-cooking, a key to developing mutton's rich taste. "Mutton went out with the arrival of electric hobs and cheap New Zealand lamb," he says. But there is more to mutton than longer cooking. "You cannot produce any old meat and call it mutton," warns former head of the National Sheep Association John Thorley, who recently helped start a Mutton Club as part of Prince Charles's campaign. "A hell of a lot of work has already happened before it is cooked." "We have a duty of care to the sheep," she says. "They have years to grow not months." The mutton revival campaign has a culinary agenda, but underneath is a strong economic imperative. Prince Charles wants to boost the incomes of British sheep farmers. At around £9.50 for a leg and £8.50 for a shoulder, mutton is comparable in price to lamb. But raising mutton is not a quick process, Mrs Davies warns. "It is not a way to make quick money." Mr Davies is the first to acknowledge that farmers are, as he puts it, "well subsidised". But there are repeated cries during the weekend that making a living as a farmer is increasingly tough, with supermarkets squeezing margins. Monmouthshire-based farmer Sarah Stacey, who sells organic meat, speculates that non-specialist farmers need 500 acres (202 hectares) to survive - twice as much as 20 years ago. Farm shop owner Gerwyn Williams says supermarkets have caused the "death" of the countryside by demanding standardised mass-produced food, and downgrading the importance of flavour. 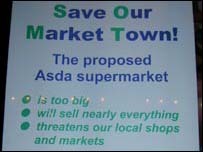 "There is no middle ground - you are either a specialist, or a mass producer [for supermarkets]," he says. 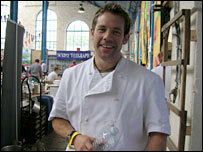 But the Ivy's Mark Hix says there is still room for farms to make space for themselves in the market. "Farmers who find a focus can do well," he says. Having focused on mutton, the Davies are planning to go one step further. The next thing on the agenda, says Mrs Davies, gesturing with her fingers, is to turn it into a delicacy, smoked, for "canapes and fancy starters". After discovering that smoked mutton was a national dish in Iceland and a key part of the Christmas meal there, the couple went to investigate. "We found smoked mutton on every street corner," says Mrs Davies. "It's as common as sliced ham here." Since then, Mr Davies has bought a second-hand smoker on eBay for £300, and been experimenting by using different curing and smoking times. As with his cooked mutton, friends and family have been the tasters. "Everyone has to give the smoked mutton marks out of ten," says Mrs Davies. If the Davies' success continues, perhaps smoked mutton might gain a new place on the menu. In Wales, at least. Should a gas pipeline be driven through the Brecon Beacons? Can green energy help save the last deep coal mine in Wales?